During one of our fourteen moves, my husband, Bill, started to work in North Carolina before we actually moved there. 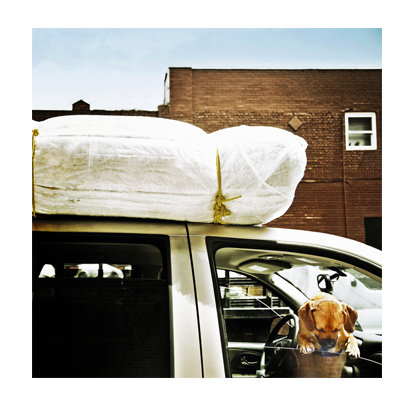 Once everything was packed and the moving van was on its way, I set out to drive the brown berry across three states loaded down with two kids, a dog, and boxes crammed in every available space. Our son, Bill Jr., was six and our daughter, Ginger, was three. I don’t remember how old the dog was. What I do remember was our road trip. It was extremely hot and the brown berry came down with heat exhaustion. (That’s what I told the kids.) In adult language, the air conditioner quit blowing cold air. Oh, it would still blow air – it was just hot air. So I rolled the windows down to let the hot air out, only to find the air coming in was even hotter. At that point, Ginger, who was sitting in the backseat, started throwing up all over herself, her doll, and the seat. Bill Jr., who was sitting in the front seat, started gagging at the smell, and the dog had his head hanging out the window, drooling from the heat. I don’t think the smell bothered him. We were not at a place where I could pull over, so with Ginger now crying, Bill Jr. gagging, and the dog drooling, I was held captive at the wheel. While I was thinking What else could possibly happen? I began to imagine Bill sitting in a new air-conditioned office somewhere. I started getting furious at him for not being here to share in this memorable experience. I’m sure you can identify with my road trip in some way. We have all had our moments of traveling chaos and calamity that eventually become memories to share and laugh about later. Whether you are moving, on vacation, or on a road trip to visit family, pack these practical tip ideas to ease the miles to your destination. Take a roll of paper towels, small garbage bags, wet wipes, and Ziploc bags in the car for cleanup, diapers, and trash. You’ll be glad you did! Air freshener really comes in handy. It covers food odors, plus all those other unpleasant smells we don’t have to mention. A first aid kit. Make sure the one you have is not outdated. A cooler with favorite snacks, juice, fruit, and sandwiches. Include a heavy-duty Ziploc bag filled with ice to soothe any minor bumps, cuts, or scrapes. For long trips, take several gallons of water. Small bottles of water don’t last very long. Don’t forget a small water bowl for your pet. Put someone in charge of keeping your dog’s leash. When you are staying at a hotel overnight, stop late in the afternoon in time for the kids to go swimming and work off some energy before bedtime. Get up for an early departure to get a good start on the day. The kids might sleep through the first few hours of the morning. Share your biggest concerns about the trip. Talk about how you can avoid those problems. Practice these words: “This is our big adventure!” Attitude is everything. Give an example of what it looks like to be kind, thoughtful, and patient with one another. Before you begin the trip to your new destination, pray together as a family. And don’t forget to make your road trip an adventure, make it fun, and make it meaningful! From Susan’s book, But Mom, I Don’t Want to Move! Love this. Funny, heartfelt and totally relatable.